Located in the Northern Panhandle of West Virginia, West Liberty University is a four-year traditional college offering a variety of academic programs and graduate degrees as well. West Liberty offers a challenging academic atmosphere for its students. In addition to an application for admission, students must have official transcripts from all colleges and universities attended. Students with less then 28 semester hours must have official transcripts and ACT or SAT scores sent from the high school. A cumulative grade point average of at least a 2.0 is required for transfer students. A student with slightly less than a 2.0 may be considered for admission by the Committee on Admissions and Credits if extenuating circumstances are involved. Evidence of honorable withdraw from a previous college must also be obtained. And if planning to live on campus, one must complete a Residence Life Application and return it with a $100 damage deposit. 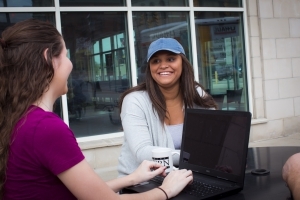 Students must also make an appointment with the Admissions Office to discuss transfer of credits and with someone in your major field or interest. No more than 72 credit hours may be transferred from a two-year college. All grades made previously in college level courses are included in the grade point average calculation. To graduate from West Liberty transfer students must have at least a 2.0 for all college-level work attempted. Students interested in visiting campus to discuss transfer admission or academic programs may make arrangements for a visit by calling the Admission Office at 1-866-West Lib ext. 8125 or 304-336-8125. Tours are available on Tuesday, Wednesday, or Thursday at 10 a.m. or 2 p.m. To request a tour, the campus tour request form must be completed online at the following link http://www.westliberty.edu/students/admissions/?id=678. The financial aid office handles all requests for information and applications on financial aid. The financial aid staff processes all types of federal financial aid after the student has filed the Free Application for Federal Student Aid (FAFSA). West Liberty’s school code is 003823. The R.B.A. degree is a non-traditional program designed for adults interested in obtaining a bachelor’s degree. For more information, contact David Wright, Coordinator, at P.O. Box 295, CSC #144, West Liberty, WV 26074, 304-336-8068, 866-WESTLIB, Ext. 8068, or conleyml@westliberty.edu.